These three resources are essential for the survival and the satisfaction of your residents. In the upper part of the screen you can see at any time the supply of your Vaults with these resources. One of them lit red or is about you should act quickly. Power is here to be the most important: Without electricity the other rooms are not working. This means no current so you cannot even produce food or water. Without water and food health of your residents decreases. Your vault is divided into rooms. First you begin with the construction of roomed areas. 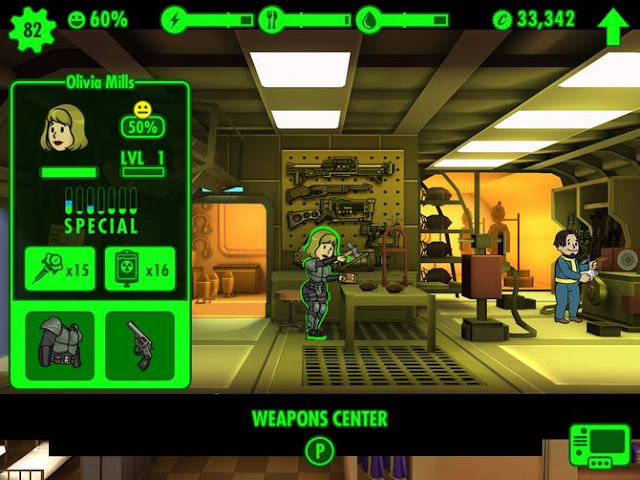 Each room has a function and is only operated in most cases, when a Vault Dweller is in the room (with drag and drop). Exceptions are eg the storage room. The rooms produce at regular intervals, depending on the capabilities of your resident’s resources. Is not that enough once you can put the room in the Tempo mode. When this is successful, then you get immediately the resources and workers a little experience points. However, it is also possible that the Turbo mode fails and an accident happens (Wheel cockroaches plague, fire, etc.) - they must eliminate your residents once and then start working again. In order to increase the chance that the Turbo mode is successful can you by the way residents use high value happiness. Once you have enough bottle caps can also upgrade your rooms. Choose only the space, and then the arrow in the top corner. This is your space more effectively. At any time you have to fulfill three missions. This you can see the bottom right of the menu. This is mostly to tasks such as resource collection, send a resident into wasteland to explore, a child witnesses etc. These tasks you should whenever possible to meet (and redeem remember). As a reward, namely wave bottle caps and even better lunch boxes. These lunchboxes include rewards such as resources, bottle caps, equipment, weapons and sometimes even high-level residents. This you should not let you escape. If two rooms the same type and the same level are adjacent they combine and become larger. While this has no advantages, but simplifies your planning and make the collection easier. What to do if no more inhabitants? At the beginning you find relatively quickly new residents for your Vault: It always meet a new candidate. But this will subside with time. That you may not ever on your few inhabitants seated You have probably beget children. For this you just send a man and a woman (Charisma higher values here are very useful) in one of the barracks. There they get closer to some very cheesy flirting and disappear behind a wall. Shortly thereafter, the woman is pregnant and can return to their old job back (maternity leave is here probably unheard of ...). Three hours later (that's all fast) is born the child and you can him if you'd like to give a name. Now it will take another three hours until the child from an adult will. Please note: Pay attention to the last name. Parents are of course never with your children themselves create children. Later in the game the way you can build a radio station that attracts new residents. But until then, you should concentrate upon it to have children. From time to time it may happen that your Vault Raider attack. Since the Vault does not work while the attack takes place, it is important that you undertake something about it. Equips the inhabitants of a space that is attacked with a weapon and armor. Caution: Pregnant women never fight and run away. You can also improve the way your Vault door to discourage raiders access to your vault. It's worth it! Send your inhabitants into wasteland! Once you've found good weapons and armor can send to your wasteland dwellers. Once there, they are looking for bottle caps, Equipment and survivors. They also of course gain experience. Do you have well-equipped people, so they sent out into the wasteland. Did you notice there is something you can call them back. Make sure that you do not go stale at the door let but collect your lost property and ordered her back into the Vault (or sends it back out). However, you should also keep in mind you this: If they die before they are returned to your Vault of course no longer get your lost property.